In a state where the governor is famous for reportedly banishing the words “climate change” from state employees’ vocabularies, you might think that no one is preparing for a world where sea levels are rising. A rise that poses a vital threat to that very same low-lying coastal state. You’d be surprised. For the last nine years, government leaders from the four counties of Florida’s southeast corner — Palm Beach, Broward, Miami-Dade and Monroe — have been meeting regularly to figure out how to meet the common challenges from a future of greater flooding, fiercer storms, bigger storm surges, worse heat waves. A future that looks like it’s arriving faster all the time. Without drawing much public attention, they’ve been working together as the Southeast Florida Regional Climate Change Compact, thinking about problems as big and diverse as sea walls, flood insurance and building codes. The group has been growing, quietly, year by year. Last week, the Compact made its biggest stride yet. At a two-day Southeast Florida Climate Change Summit in Fort Lauderdale, previously reticent business leaders for the first time joined the climate experts and county staffers and elected officials. Together, they pledged to build “the business case” for making proactive investments in the infrastructure that will be needed to protect our communities and the commerce we all depend on. 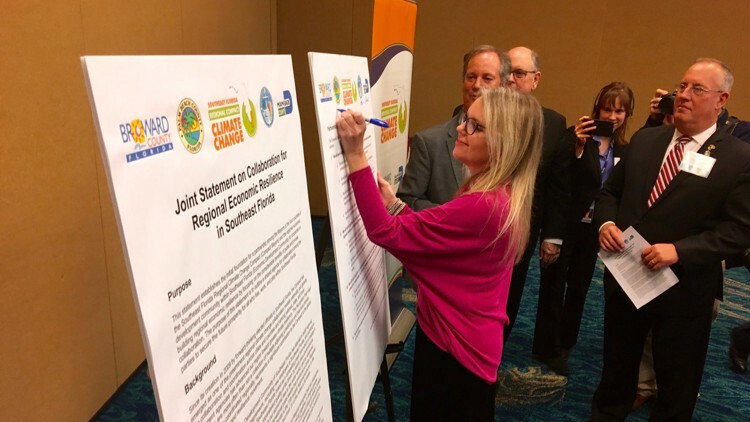 To make it official, the mayors of each county — Palm Beach County Mayor Melissa McKinlay among them — and business representatives signed a joint statement vowing to collaborate on measures for regional economic resilience. Some city leaders did, too. This is forward-thinking stuff, and in the months and years ahead we’re going to need more people and more groups signing on, in spirit if not in ink, to get ready for the massive changes coming our way because of climate change. Whether or not you believe that our heavy use of fossil fuels is the cause, you can’t deny that the planet is getting hotter and the sea levels are getting higher. That’s just observable fact. The impacts aren’t being felt only along the coast, where flooding during king tides is becoming noticeably more pronounced. LaMarca noted that 15 inches of rain fell in west Broward near the Everglades in June, causing flooding in the parking lots at the sprawling Sawgrass Mills Mall, shutting the second-largest mall in Florida for three days for a $30 million loss. McKinlay said she is worried about the potential impact on agriculture, one of Florida’s strongest economic pillars, as well as Palm Beach County’s. The farms and orchards are susceptible to new invasive pests and diseases, along with increasingly intense natural disasters and changing rainfall and temperature patterns. And more than that. If seas rise high enough, “we’ll see a westward migration of population” in the county, McKinlay said — putting new pressures on agricultural communities and taking farming lands out of production. The whole South Florida region will feel the effects because, for one thing, the region is built upon a foundation of limestone. That’s porous. The rising waters won’t just come over the coastline. They’ll swell up from underground. With Greenland and Antarctica melting faster than scientists predicted just a few years ago, the world’s sea levels are rising at a scary pace. According to the advocacy group SeaLevelRise.org, in the last 60 years, the the sea level rose by the length of an iPhone, about 5.5 inches. But now, scientists forecast, it will take just 20 years for the sea level to gain another 5.5 inches. South Florida is regarded as one of the world’s most vulnerable spots for even a modest rise. This is an economy that produced a gross regional product of $389 billion in 2016. We’re the 11th largest regional economy in the nation, contributing more to the U.S. gross domestic product than 31 of the nation’s 50 states, according to the Compact. That’s why it’s so encouraging that business groups are getting on board. When the abstractions about a hotter planet turn into specific projections of economic losses, when banks start balking at writing mortgages for coastal homes – that’s when real pressure will be put on politicians to do what needs to be done. “The economy and finance drive almost everything,” said Monroe County Mayor David Rice. From Key West to Jupiter, the county governments have appointed resiliency or sustainability officers (Palm Beach County has a vacancy just now) to assess risks and infrastructure needs. “We need to put a resiliency component in everything” the county plans for, McKinlay said. A big question is, who’s going to pay for strengthening sea walls or, as Miami Beach is doing, raising streets and modernizing pumps? We have a White House whose occupant called climate change a hoax invented by the Chinese, a nervy denial given the glaring susceptibility of Mar-a-Lago. Just 41 percent of adults in Palm Beach County believe global warming “will harm me personally,” according to a 2016 Yale University survey; 45 percent in Broward; 51 percent in Miami-Dade. The national average is just 38 percent. Those numbers need to be way higher before pressure builds for real action. So, kudos, indeed, to our local governments . This is a rare instance where the leaders are ahead of many of the populace. And kudos to the business leaders who are joining in. That’s what has U.S. Rep. Ted Deutch, who addressed the group Friday morning, feeling encouraged. “They were very receptive to the fact that we need to find ways to address this issue,” he said after meeting with a smaller group of business leaders. What we need now is to build public awareness of the risks that are coming, and for Tallahassee and the White House to get their heads out of the sand. That sand is going to be inundated with water sooner than many of us think. We have preparations to make. Editorial Page Editor Rick Christie contributed to this story.